Pool table lights are lights that are installed above a pool table to create a warm atmosphere on your pool table. With proper lights, you can also alleviate any shadows or glares while you enjoy a relaxing game of pool. These lights make the game more enjoyable and ensure that you do not strain your eyes or irritate them due to poor lighting; thus the importance of a good bulb. Each shade on these light fixtures is carefully crafted so as to meet regulation sizes. You can order a custom pool table lights to achieve a unique billiard or media room of your own. Alternatively, if you are getting the lights for a bar or club, you can save money by bulk ordering discount pool table lights. No matter where you find your lights they all serve the same purpose. 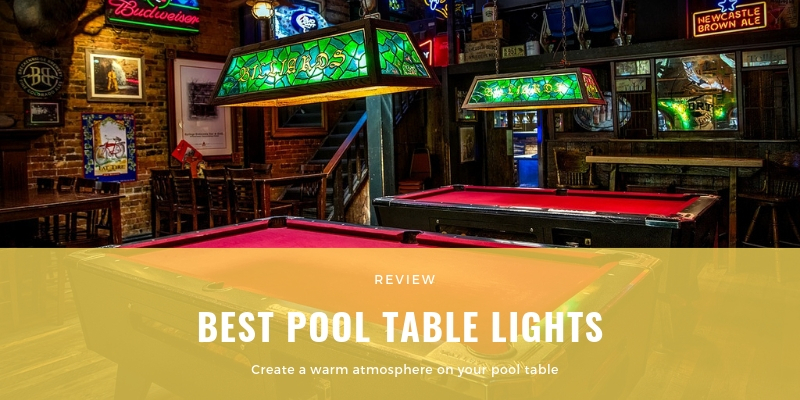 These lights are designed, primarily, to keep your pool table playing area bright so that no shadows are created and players always have a clear line of sight when shooting. They create the perfect brightness and placement if install properly, so that you can shoot from anywhere in the room and still enjoy a perfect view. The function of these lights will not differ for all types of lights that are available to the average consumer. When you are choosing lights for your pool table, you can select from 4 standard types. You can of course order custom pool table lights that suit your particular needs if the standard types are not per your taste however most people would stick to these types. Choosing the types are usually very straight forward as it will depend on the dimension of your pool table. You may have a small pool table that is 3.7 feet by 7 feet which means you should invest in a 3 shade light fixture, whereas if you have a large 6 foot by 12-foot snooker table, you will want a five shade light. The chart below will help you determine which type of table light works best for your pool table. You may also take note of the recommended length for each type of lights. After deciding on the type of light fixture that is suitable for your pool table, you need to choose the design for your pool table lights. There are many types of design available to the average consumer and the type you buy will be based primarily on what you want to have in your room. If you are decorating a new media room, for example, and you just invested in a sleek chrome bar at one end of the room, then a chrome dome design might be the best pick for your lights. If instead, you are selecting pool table lighting for a new billiard room at the end of your restaurant or club, then you may want a brass bar light or stained glass promotional light for the beer brands you sell such as Budweiser, Bud Light, Coors, or Miller. 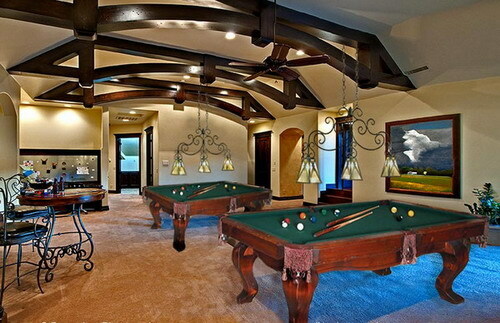 Ultimately, you won’t go wrong if you complement the design for the lighting of your pool table with the room’s decor. After you have selected a design, you can order your new pool table lighting system as a stand-alone item or get a set. Some sets come with light bulbs but many do not. Almost every light system can withstand a 60-watt bulb but sometimes these light bulbs make it too hot around the top of the lamp shade; of which you will have to switch to a 40 watt. Other than the heat, you should consider the brightness of the lighting too when you are installing your bulbs. If a 60-watt bulb is too bright and creates a glare which irritates your eyes then you should try a 40-watt bulb. But if you start with a 40-watt bulb and it is too dim, it will have an adverse effect on your depth of perception and you may consider switching to a 60 watt. Having said that, it is definitely advisable for you to play around with 40-watt bulbs and 60-watt bulbs to find which one works best for you. When you are experimenting which bulbs are more suitable for your pool table, ensure that the lights are of the correct height. This is because the height of the lights will also have an effect on the dimness and heat. How High Should the Lights Be Installed? When you are installing pool table light fixtures, your goal is to allow for optimal play. If you have too many flood lights hanging above the pool table area or below the ceiling it can minimize shadows but it will also hinder your clear field of view. When you hang pool table light fixtures, you want to make sure you have the optimal height which is between 31’’ to 33’’ from the top of your table’s playing surface to the bottom of the lamp shades. The measurement remains the same no matter which lights you are installing. If you are measuring from the floor prior to having the pool table installed then you want the bottom of the shade to reach 61’’ to 63’’ above the floor. You may have to adjust the height again once the table is installed in order to get adequate lighting depending on the size of your pool table. Bear in mind that the height is only one part that you should take note of when installing the lights. There are many other important details that you need to understand before doing the installation of pool table lights such as wiring and switches. Once you order your new pool table lights, you need to properly install them so that you will not encounter problems like loose wiring, bulbs that cannot be switch on or worse, lights falling. As such, this is not something you should do on your own because many light fixtures must be mounted to your ceiling properly. If you order the light as a set kit then you will have all of the pieces you need to install the new lights and the time required of the professional will be limited. However, if you order discount pool table lights from a third party then you will want to ensure that you have a complete list of the necessary parts for installation from the manufacturer. By ensuring all this, you are assured that your lighting system will be installed properly. On a side note; if you can, be sure to install the lights prior to installing the pool table so that you do not damage the cloth. If your table is already installed then invest in a cover for the table prior to hiring an electrician. Now that you have understood and ready to buy your pool table lights, the question is where do you go to buy them? There are a few places that you can go to purchase your lights. Firstly, you can head straight to a manufacturer but this is only feasible if you are located near them. Alternatively, you can visit your local lighting store and place an order. But the easiest option is to search online for a variety of lights that you desire including chrome modern pool table lights. There are many sites that sell lighting fixture but I would recommend you start with my top 3 websites for lighting fixture. 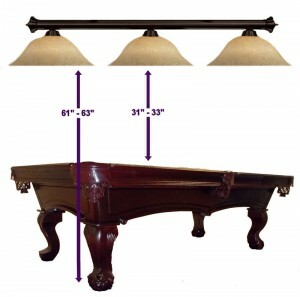 You can even order a custom pool table light constructed for your specific table on the internet. On top of that, if you are not too particular about design, there are many sports and beer related companies that offer the perfect lights for your billiards room. Placing bulk orders can save you a lot of money and it will also earn you free shipping for some of the designs. If you have a budget constraint, you can buy used pool table lights online for much less money. In fact, purchasing cheap pool table lights can save you upwards of fifty percent off of the manufacturer’s price if you are willing to look for the good deals. Alternatively, you can embark on a DIY project and build your very own lighting for your pool table. I’ve created a comprehensive post on how to create your own pool table lights. Do check out the post before you start on your project! 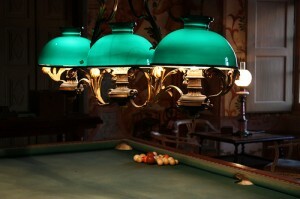 Bring your pool table into the light by shopping online at LightingShowplace.com. They tout their mission as providing customers with the most variety of products which includes fans, table lamps and lighting fixtures. In total, they offer more than 150,000 products at rock bottom price. And they have a top notch customer service which can be access via their user friendly website. Lighting Showplace offers 7 days a week customer service and a 110 % low price guarantee against their competition. They also offer free transit breakage insurance if your order is broken between them and your delivery point. Working out of Chico, CA, but shipping direct from the manufacturer, this online store also offers free customer service by telephone or email. Lighting Showplace ships their products by standard carrier or by freight for large and oversize items. They say their shipping charge is usually around $5. Watch for free shipping promotions. Even better, they claim to stand behind all of their products. With such confidence, Lighting Showplace has placed a guarantee on all their products that it will bring satisfaction to every customer. If not, they will be more than willing to make a replacement. 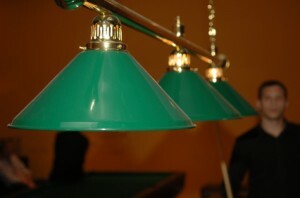 Brighten your pool table with a great light kit from ProgressiveLighting.com. Their collections include Fiess, Barrington and Landmark lighting kits. Doing business out of Duluth, GA, Progressive Lighting says its pool table lights are designed to provide optimal lighting and help you stay on top of your game. This company has been offering modern and old fashion styled lighting kits in Tiffany, Lurray, Game Room and Classic styling for more than 45 years. They boast the most number of physical retail stores in the Southeastern United States which includes in Charlotte, NC and Atlanta, GA.
Progressive Lighting has made a name for themselves as a lighting company that delivers unique lighting fixtures that have an elegant design to it. In addition, this company is also known for its quality shopping experience; be it if you are shopping in their retail store or online on their website. They offer customer service Monday through Friday from 9am to 5pm EST. They can be contacted by email or telephone, and there is a store locator on their site to help you find a local outlet. Progressive Lighting offers free shipping for all orders more than $49 within the continental United States. Oversize and heavy items may cost more for delivery. They have price guarantees too and will match any published Internet price from a competitor. Make a bookmark online if you find an advertised price that is lower and send it to them. They will verify and give you the matching price if the price turns out to be true. They also ensure customers that if an item goes on sale after he or she has already purchased it, Progressive will honor the sale price. The customer must call within 30 days of their original purchase to receive a refund for the difference in pricing. You’ve probably heard of Lamps Plus. They are nationally advertised and well known for their variety, quality, and the great prices. Their product line boasts the collections of Vetraio, Vicosa, and Genova. Their website gives the shopper not only great first glimpse but also additional magnified images and text highlights with just a click. Since opening in 1976, Lamps Plus has grown into the largest specialty lighting company in the United States; with more than 40 lighting superstores spread across the Western US. Their range of services includes in–home lighting consultations, as well as in-store lighting seminars. They engage only licensed electricians for their home visits. American Lighting Association (ALA) certified lighting designers are available to offer product recommendations and lighting advice in all their stores. For customer service you can contact them by phone or online at LampsPlus.com. They also offer a 120% low price guarantee, a 60 day return policy, and free shipping for more than 30,000 items. For all 3 websites that I’ve recommended, they have an obvious similarity which is that it is not just about the functionality and looks of their website but more of the whole customer’s shopping experience. All 3 websites provides a vast array of choice for you to pick the most suitable pool table lights which are, in my opinion, the most important factor for any online shop. Personally, I wouldn’t want to shop at sites that have limited products to choose from. The second factor that I looked for is the price point. These 3 sites offer very competitive price and even guarantees their price. What this means is that if you are able to prove that there is another merchant that offers a lower price than what they have offered, these 3 sites will gladly match the price of that merchant. So you are definitely getting the lowest-priced lighting. 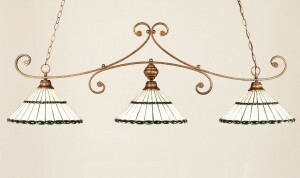 So if you are planning to get a lighting fixture for your pool table and don’t need to physically see the products before making any purchase, I suggest you shop online through either one of the 3 websites above. For a customized pool table lights, you need to visit specialized lighting experts such as Elusive Lighting. But before buying a customized pool table lights, do read my post on ‘Checklist for buying a custom pool table light’. I hope this will help you with your quest of buying the perfect lighting fixture for your pool table. Ultimately, the most important matter is you have a perfect light to match your pool table; be it you bought it online through these websites or via your nearest retail store. Overall there are many pool table lights available for private or public use. Selecting the right one is based on your personal preference in large part and on the size of the table you have. Once you select the type of lights you want you need to have them professionally installed and verify that the bulbs you picked provide the perfect lighting overall. Then you are well on your way to enjoying your new table! Check out my compilation of the most unique pool table lighting fixtures.